Steem rebounds, but will it last?steemCreated with Sketch. 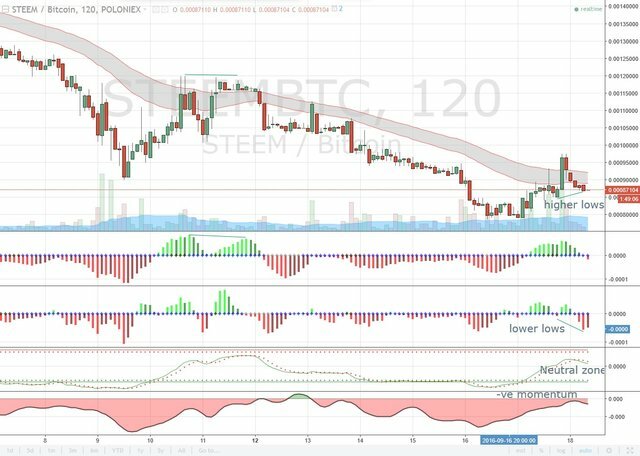 Bottomline: Although we seem to see some signs of bottoming at the moment, I doubt capitulation has occurred at this time - which means STEEM/BTC could continue its downward descent after this retracement has run out of steem. That retracement did continue and it pulled back above the 1st resistance level of 0.00092 but below the 2nd one at 0.00104 as shared in my last post . However, this sharp spike was not sustainable and a bear divergence emerged quickly, reversing this spike. Nevertheless, the current uptrend looks intact for now. Probability: Still treading in the neutral zone, as the quick reversal of that earlier up-spike avoided STEEM being overbought. Momentum, although negative, has continued to hover near the zero level, It would not take much to cross over to positive territory at this stage. Support and Resistance: The recent spike high at 0.000975 would be the new, near-term resistance. Beyond that the next one remains unchanged at 0.00104. In terms of support, 0.000812 should provide some. Beyond that, we go back to no-mans-land for volume profile and I would continue to go with 0.00052 based on pre-boom tops and bottoms seen. Bottomline: My optimism for this reversal to stick has increased a whole lot based on recent price actions. Near time wise, it should continue to trend upwards to re-test that 0.00097 spike level. If it breaks that, then we head back up above 0.001. The nagging thought that still plagues me is that we have not seen capitulation yet, and that is what needs to happen before all the weak hands have been cleansed before a new virtuous sustainable recovery uptrend cycle can begin. I noticed there were some fairly large buys earlier, but I haven't been watching Steem long enough to know whether that is normal or not.. But I would assume large buys and sell offers would affect the price yes ? Thanks for the upvote majes. Yes, volumes are important to price definitely. Every large move in either direction should be driven by large volumes to signal a credible price action and to remove doubt of a distorted move in a thin market. so for the past few long green candles we saw, those were done with decent buy volumes - hence a new sustainable trend upwards emerged thereafter. Thanks for your comments and upvote. I have seen worse shitcoins with lame roadmaps and adoption get pumped and dumped a number of times. 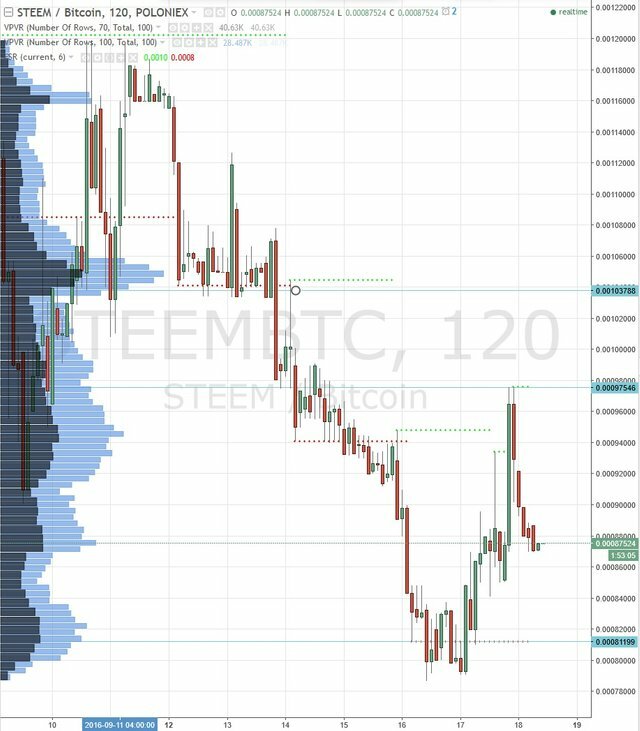 Steem is still in its infancy stage and I believe there are opportunities to see more prolonged rallies after reversal. The forgiving trade is to look for long entries on overshoots -> that's the capitulation that I am aiming for. i followed so i can check out your future posts and hopefully learn more. thanks for the reply. yup. I also bought shifted some into steem power and it is growing steadily each day. every sp helps the curating process too. if you want to be here and make some, you need to get all the SP you can get ! !